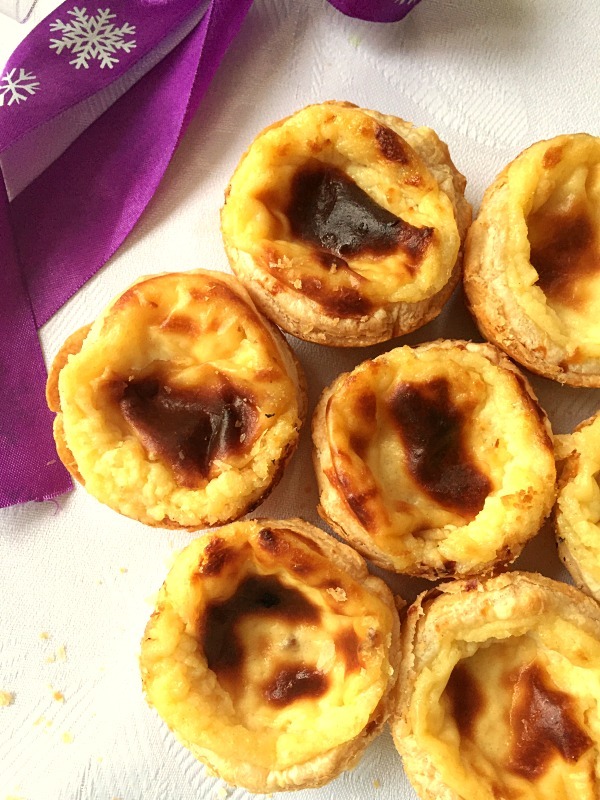 Portuguese Custard Tarts or Pastéis de Nata, heavenly delicious bites that are super easy to make at home. I first discovered them when l was in Portugal and l just loved them. They bring back so many happy memories of my time spent there as an Erasmus student at the University of Porto. It was my first time away from home, first Christmas and New Year spent without my family, but it was a great experience. Porto is such a beautiful city with a rich history and amazing people. I cannot recommend it enough as a travel destination. Every time l bake these pretty little tarts l remember the beautiful pastélarias ( pastry shops), and although they taste fantastic, somehow it is not the same divine taste they have back in Portugal. 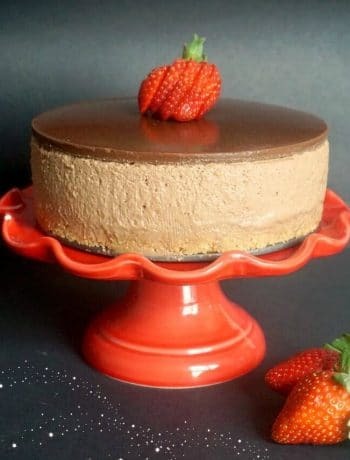 But they are so easy to make, l am sure you will want to give them a try. Who doesn’t like custard? Or the delicate vanilla flavour? I certainly do. Why are the great as party bites? Well, you need not worry about accidentally staining your clothes with chocolatey creams, or worry they won’t last long if it’s warm in the room. One batch makes 10 tarts, with about 2 batches you are good to go, your guests will be so impressed. Some shops around here sell these custard tarts for over £1 each. That’s outrageous, given the fact that you only need simple ingredients you already have in your kitchen. And they end up being super cheap too if you bake them yourself. Even a beginner in baking can make them in no time, trust me. 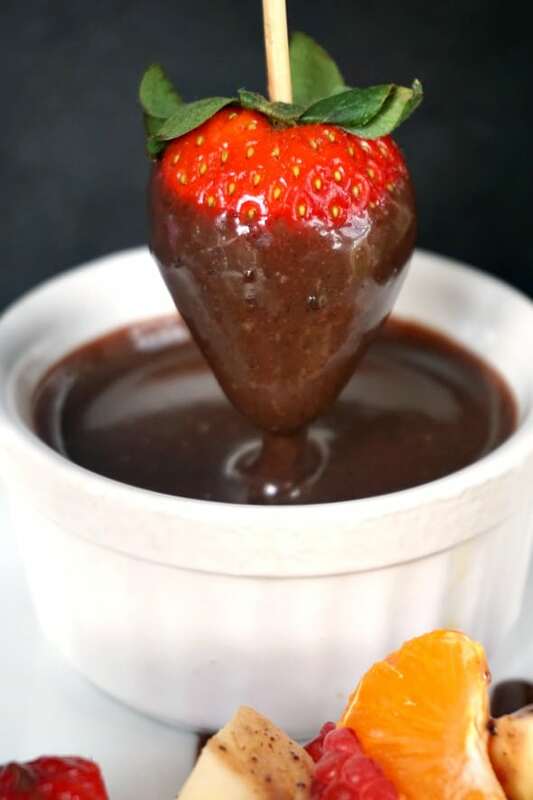 Together with some Brazilian brigadeiros or some Coconut truffles, you have managed to take care of the desserts easily. Just perfect, right? 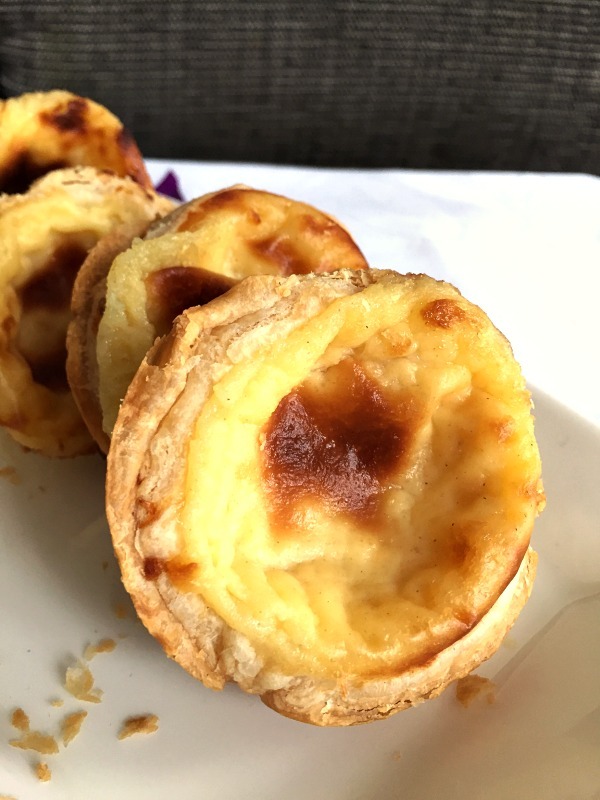 If you’ve tried these PORTUGUESE CUSTARD TARTS – PORTUGUESE PASTEIS DE NATA or any other recipe on the blog then don’t forget to rate the recipe and let me know how you got on in the comments below, I love hearing from you! You can also FOLLOW ME on FACEBOOK, and PINTEREST to see more delicious food and what I’m getting up to. 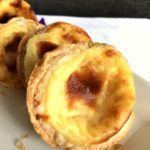 Portuguese Pastéis de nata recipe (Portuguese custard tarts) the ideal party bites ideas. Made with a flaky egg pastry and a beautifully flavoured custard filling, these tarts are sheer heaven. Slightly grease a muffin tin, it can either be vegetable oil or butter. 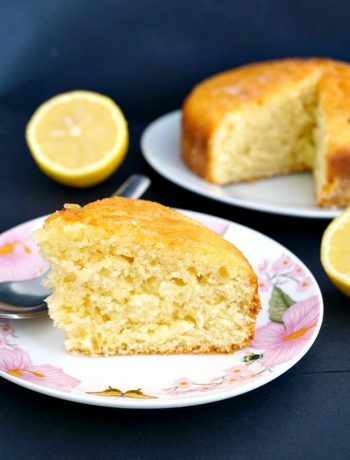 In a large bowl, whisk together the egg yolks, whole egg, sugar and plain flour until you get a smooth paste. Pour in the milk and whisk again. Transfer the mixture to a sauce pan and simmer on a low heat until it thickens. Remove from the heat and leave it to cool completely, then add the vanilla extract. Transfer the puff pastry roll to a working surface and use a cookie cutter to cut 10 rounds that fit in the muffin tin holes. Press the rounds into the muffin tin holes and spoon in the custard cream evenly. Bake for 30-35 minutes until golden and the pastry is baked through. Allow them to cool, then use a sharp knife to ease up the edges and transfer the tarts to a plate. 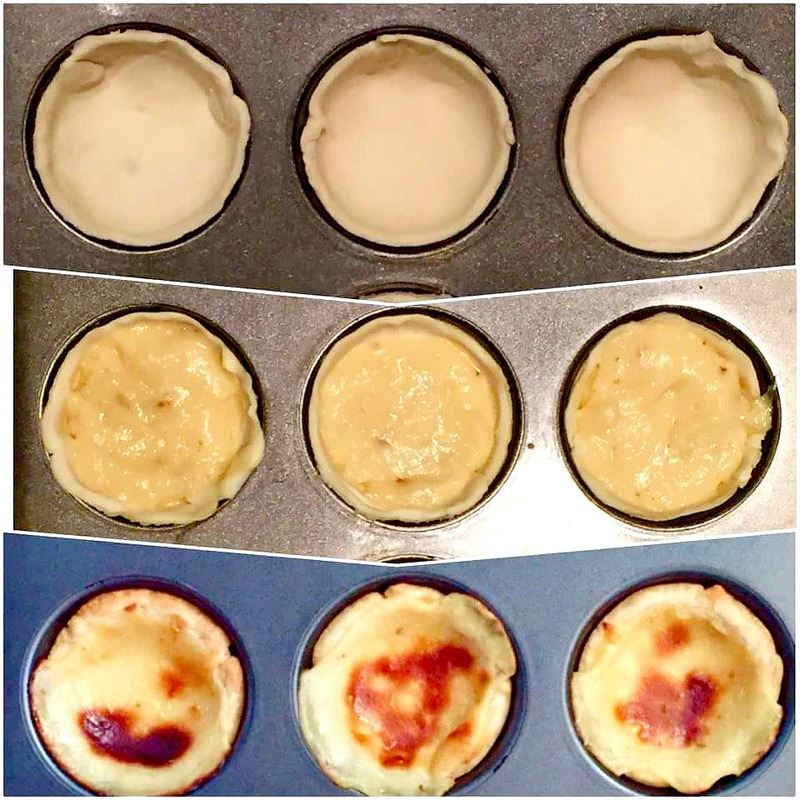 Once out of the oven, the custard will sink in, so not to worry if in the oven the tarts looked popped out. Serve cold from the fridge. Great recipe for the holidays! Thank you, Millie. I tried with short crust pastry too, but l prefer the puff pastry, it makes the tarts a lot lighter. I must try the caramel ones ? Hi Daniela. I’ve just tried again to reply to this comment from my notifications box and it still won’t .send’. Also, the ‘follow’ tag at the lower right hand side of your page still pops up inviting me to follow you – which I have done 3 times since you upgraded your site. I’ve filled in my email address as well. Hi Millie! So sorry for that, it appears that being self-hosted means that the people can no longer follow me via the follow button, but only if they subscribe via e-mail. I’ve managed to desactivate the follow me button since it doesn’t work now anyway. The creme caramel sounds delicious ? I did fill in th email subscription too, Daniela, but if needbe, I’ll do it again. I just can’t work out why comments won’t send to you. They work with everyone else, so something is wrong. I’m writing this on your page again, after trying to send it (unsuccessfully) from my notification box).